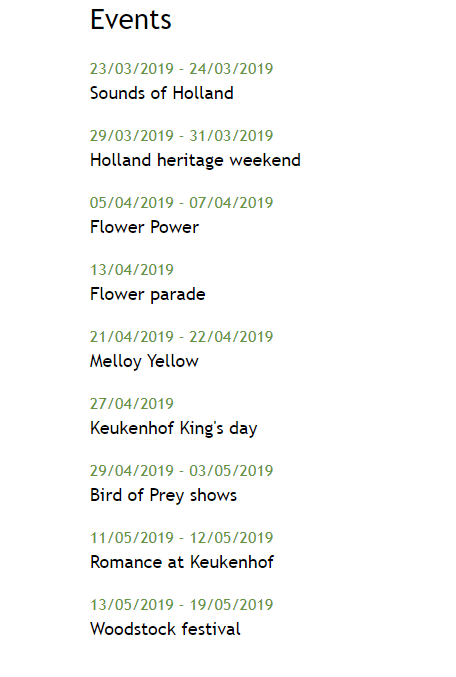 You may upgrade your ticket to visit either "This is Holland", "Rijkmuseum" or "Adam Lookout"
Enjoy skip-the-line privileges at Keukenhof Gardens and gain entry into the iconic Netherland attraction without having to wait in long queues! Step into a spectacular floral paradise and explore the most beautiful spring garden in the world at leisure. Explore 32 hectares of flowers gardens, attend unique flower shows, admire the inspirational gardens and more. Experience Holland from a bird’s eye view at Amsterdam’s new and exciting attraction: ‘This is Holland’ or admire some of the greatest works of art in history at the renowned Rijksmuseum or a a visit to A’DAM Lookout which promises fabulous views of Amsterdam from the 20th floor and a delightful introduction to the beautiful city! With return bus transfers from Amsterdam included in the package, enjoy comfort and convenience in traveling as well as admission to the famous attraction without waiting. Enjoy the ride with a visual presentation onboard in English along with a printed multilingual Keukenhof brochure. Make your way to "THIS IS HOLLAND"
Address: Overhoeksplein 51, Amsterdam By Boat :Take free ferry from Central Station to the opposite side, ‘Buikslotermeer’. This is only a 3 minute boat trip to "THIS IS HOLLAND". Reach A’DAM Tower at a convenient time. Zip to the 20th floor of the tower in the “Goes to Heaven” elevator in just 22 seconds and reach A’DAM Lookout, the observation deck offering jaw-dropping views of Amsterdam from a fabulous vantage point. Take in spectacular bird’s eye views of the city’s historical centre, its pulsating port, the unique Dutch polder landscape and the famous canals which belong to the UNESCO world heritage list. The interactive exhibition on the history of the canals promises a highly engaging experience. Start your tour at any desired time at ‘This is Holland’, the ultimate flight experience over Holland in Amsterdam! While flying over the beautiful landscapes, you will get an idea of how Holland was created. For the Dutch, water is both their best friend and enemy alike. Using mounds, dikes, windmills and polders, the Dutch succeeded in reclaiming land from the sea creating the extraordinary country below sea-level. Learn about the ingenuity behind these structures through this unique flight experience. Avoid the long queues in the museum and head directly to see the masterpieces of Rembrandt, Frans Hals and Johannes Vermeer. The national museum has been renovated, yet the Gothic and Renaissance style is still visible throughout this unique building. The Rijksmuseum offers an extensive collection of artwork, crafts and historical pieces dating back from the year 1200 to the present, including masterpieces such as Vermeer’s Milkmaid and Rembrandt’s Night Watch. Absorb the culture and see one-of-a kind artwork. Eight thousand objects are on display in 80 galleries, with a variety of exhibits that are sure to impress. 2019 marks the 350th anniversary of Rembrandt's death. The Rijksmuseum will celebrate the greatest master of the Dutch Golden Age with the Year of Rembrandt. The museum will present several major exhibitions, events, and activities dedicated to Rembrandt. The Rijksmuseum is world famous for its collection of masterpieces by Rembrandt and other significant Dutch artists of the Golden Age. Board the Hop on Hop off Keukenhof bus right from the doorstep of the A’DAM Tower. Enjoy a comfortable bus ride to Keukenhof Gardens and take in the picturesque Dutch landscape en route. Sit back and enjoy a comfortable drive, while enjoying a video on Holland and Keukenhof, which is a popular Netherland attraction. You will be reaching the Keukenhof Gardens in less than an hour. Avoid long queues and enjoy a skip-the-line entry to the most picturesque spring garden in the world. Explore 32 hectares of flowers gardens, enjoy unique flower shows, inspirational gardens, unique artwork and wonderful events. See more than 7 million bulbs, 800 varieties of Tulips and rejuvenate your senses in the garden’s picturesque setting. Don’t miss out on the 2019 theme of “Flower Power”, which has early 1970’s vibe. After spending time in the Keukenhof Gardens, hop on the bus to return to Amsterdam. You may redeem your voucher at the check in desk at This is Holland. You will get your Keukenhof bus ticket. The return bus ticket includes entry to Keukenhof. At Keukenhof your ticket will be scanned and allows you to bypass the queues. You will need to show your Keukenhof bus ticket for the return travel. You can stay for a maximum of 3.5 hours approx. at Keukenhof. Please show your Keukenhof bus ticket for your return trip to Amsterdam. The ticket is only valid on the day of the stamp. You will receive your ticket for admission to A’DAM Lookout upon presentation of your voucher. This entrance ticket includes a digital memory photo. You may visit at any desired time. Big backpacks and bags should be kept in provided lockers. Pets are not permitted. Guests with mobility issues, must be able to sit on the ride seat by themselves or with the assistance of a companion. At the check in desk you will get your entry ticket to “This is Holland” which you may visit at your leisure. E-ticket holders can make use of fast-track entry. You may have to queue outside the museum. These queues are for all visitors. The busiest times are Fri, Sat and Sun between 11:00am and 3:00pm on bank holidays and during the holiday period. Children up to 18 years of age are allowed free entry to the museum. Voucher Information: Sorry, but we will need you to print a paper version of your booking voucher (we're working on changing this). At this time of booking. Don't worry if you haven't booked your hotel yet, you pass them onto the operator.